The Spinal cord nerve ending model illustrates the composition of the spinal cord, magnified to a scale of about 5:1. The spinal cord is formed by a central channel surrounded by "gray matter" with an outer layer of "white matter". The base features illustrations of various cross-sections of the spinal cord through the white and gray matter at the neck, torso and lumbar and sacral regions. 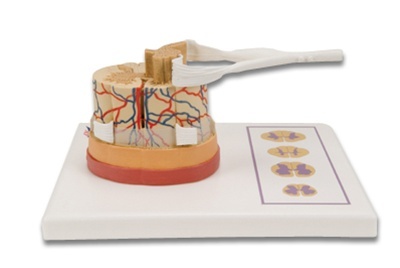 The Spinal Cord with Nerve Endings model is supplied on a base. This Spinal Cord with Nerve Endings model is a great tool for teaching the anatomy of the human nervous system.